Home » climate and security » Balkan floods: an opportunity amid destruction? Balkan floods: an opportunity amid destruction? 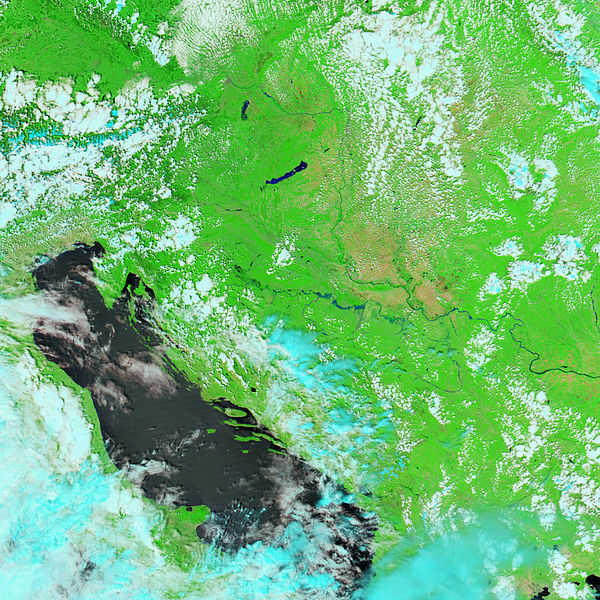 After persistent rainstorms from mid-April to mid-May, massive floods hit the economically struggling Balkan nations of Serbia and Bosnia (and to a lesser extent, Croatia). Those floods that occurred after heavy rainfall from May 14-15 have been described as “the worst in 120 years.” As of May 28, the floods were reported to have left 33 dead and hundreds of thousands displaced, and swept away crops, livestock and landmines, leading to significant economic and financial losses (estimated losses of 1.3 billion euros in Bosnia alone). And according to researchers, these extreme weather events are likely to plague the region more and more in the future, as a result of a changing climate. But in responding to the disaster, and in building resilience to future events like it, there may be an opportunity to resolve long-standing tensions. The nations most affected by the floods – Serbia and Bosnia – have a very recent history of conflict. While relations between Serbia and Croatia, as well as between Serbia and Bosnia, have improved since the conclusion of the Dayton Accords, the handover of stabilization duties in Bosnia from NATO to a European Union peace-keeping force and police mission, and Bosnia’s signature of a Stabilisation and Association Agreement (SAA) with the European Union in 2008, tensions over governance in Bosnia, including the Republika Srpska (the majority ethnic-Serb region of Bosnia) persist. However, the response to this effort by a coalition of Balkan nations does carry with it a very real opportunity for putting some of those tensions to rest (at least for the time being). Just as tensions between Greece and Turkey were dramatically lessened in the wake of earthquakes in both countries, due to unprecedented cooperation between the two governments, a responsible, robust and cooperative post-disaster rebuilding effort in the Balkans holds the same potential. The initial response, at least, was encouraging. The floods did not recognize national boundaries, and neither did the rescue teams from Macedonia, Slovenia and Croatia, who came to the aid of Serbia and Bosnia. The disaster, and the response from neighboring nations, has already reportedly led to subsiding religious tensions, as highlighted by the Catholic News Agency. However, the disaster also uncovered potent reminders of past grievances. For example, the receding floodwaters revealed unexploded landmines from the 1992-5 war, some of which had been carried great distances by the floods. In this context, close cooperation between Serbia, Bosnia and assisting nations in the region on clearing these mines may prove critical to easing tensions, and building trust for further cooperation on a broader range of issues. A week and a half after the flooding, the region is turning from emergency disaster response to the long and difficult process of clean up, rebuilding and advancing measures to prevent such disasters in the future. Tens of thousands have been left homeless. Reports indicate that close to 117,000 cubic meters of waste has to be cleared. The affected nations, with regional and international support (22 EU member states offered assistance), must pick up the pieces and rebuild a more climate-resilient infrastructure. A good place to start is a flood resilience program, as advocated by the World Meteorological Organization. But the window for cooperation in the wake of such natural disasters is narrow. Fingers are already starting to point to the failure of government in the region to declare emergencies (see here). In this time of destruction there is an opportunity to build trust, and to strengthen relations between the Balkan nations. This will not just help build resilience to future floods. It may also help build a more cooperative, stable and prosperous region. By Caitlin Werrell and Francesco Femia in climate and security on June 4, 2014 .